The translator bears a particular kind of ethical responsibility towards the text, the poet, and poet’s community. 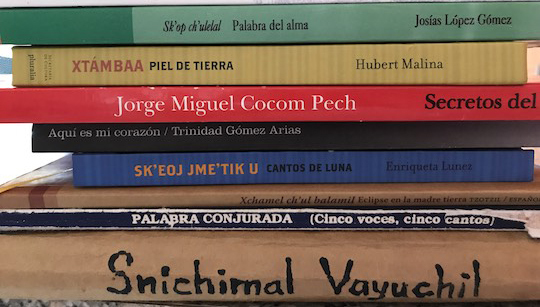 Perhaps it goes without saying, but in 2018 translating Indigenous literatures in the Américas from Indigenous languages and/or Spanish is a political act. Even prior to now, at dinner parties and other settings for droll conversation in the United States, people have often perked up when I mention that I study Mesoamerican languages and cultures. With an interest typically grounded in lost civilizations, ancient mysteries, and, occasionally, UFOs, they usually then follow up with an inquiry as to why, if I study dead languages, I didn’t opt to study Latin, ancient Greek, or Biblical Hebrew instead. When I assert that no, Maya languages such as Yucatec and Tsotsil are far from dead, many people refuse to believe it and are more than happy to contest the point.